In making these tacos, I confess that I did not try very hard to follow any sort of traditional process or even really do any research… Unless you count going to a couple of Korean restaurants in my lifetime.Hopefully, people see these tacos as a fun tribute to Korean barbecue and not as blatant cultural misappropriation. So let’s give these tacos the “inspired by” tag – these are not meant to be authentic. That said, they are fun to make and delicious. I had a good time stir-frying the beef and grilling scallions – that’s quick work that makes this a fast a dinner. I also quick-pickled some cabbage and red onion as a topping. That was more labor-intensive, but you could substitute with any old slaw or kimchi. You can also make everything ahead of time and take your ingredients out to the grill – that would make for a really nice outside-of-the-box outdoor dinner. Another thing about this dinner: I had to use a bunch of shortcuts. The recipe I used as a reference recommended adding some lime juice at the end, and I had to use lemon juice. I also planned to stir-fry the beef with basil… which I forgot to buy at Publix. Whoops. Yet against all odds, including my currently depeleted spice cabinet, these tacos turned out well. I ate them for dinner and made a special trip home to eat them for lunch the next day. These are leave-work tacos. Slice your cut of beef into long, thin strips (it helps if the meat is cold). In a large, non-reactive container, whisk together the peanut oil, soy sauce, vinegar, fish sauce, peppercorns and a little salt and pepper. Add the slices of beef and let it marinate for 15 minutes or as long as a few hours. 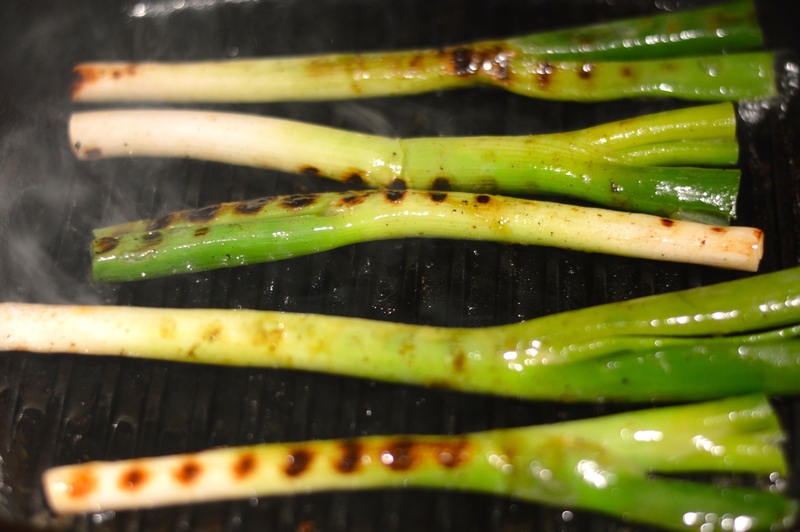 To grill scallions – place a grill pan on high heat. Trim the ends of the scallions and remove the outer layer. Place scallions on the grill pan with plenty of space between each one, and don’t touch them for 3-5 minutes. Leaving them alone will allow nice grill marks to form. Flip scallions and cook for another 2-3 minutes until they have softened. Remove from the grill pan. In a large skillet over medium high heat, add a little peanut oil. When the oil is shimmering and hot, add your meat to the pan and stir every few minutes. As soon as the meat loses its pinkness, remove from the pan and squeeze lemon juice over the top of the meat. 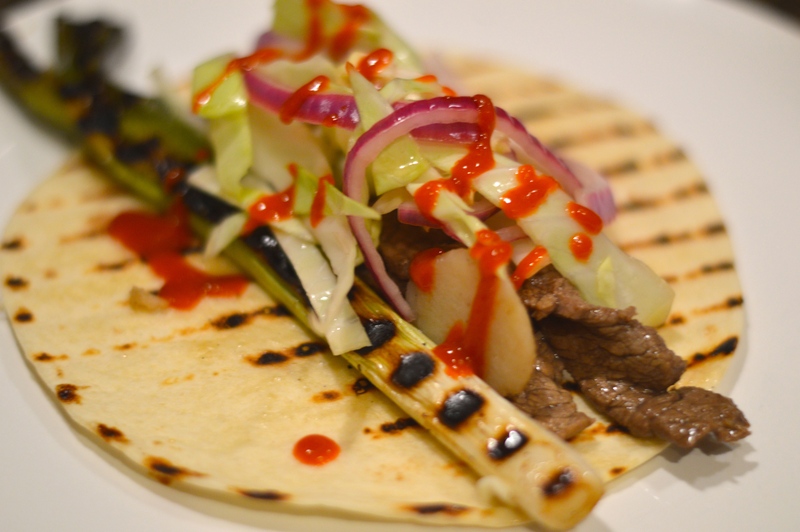 Build tacos by adding the meat and scallion, then topping with your vegetables and sauce of your choice. I used sriracha, but you could use whatever sauce you like. This is a flexible recipe.